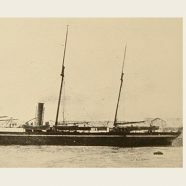 On the evening of August 30th 1881 the Royal Mail Ship Teuton was steaming at a steady 12 knots off the Cape south coast en route to Algoa Bay in South Africa. Since her departure from Table Bay at 10am that morning, conditions had been most favourable and many passengers had taken advantage of the mild winter afternoon to stroll on the sunny deck and enjoy the view of the coastline some 6 miles distant. By 7:20pm the passengers had already enjoyed a hearty dinner and were being served coffee. Captain Edward Manning and his Chief Officer Eugene Wardroper were still in attendance in the dining saloon. Suddenly there was a tremendous grinding crash and the ship shuddered and heaved, sending dishes and cutlery flying from the tables. Pandemonium ensued as passengers lurched to their feet. Chief Steward Purkis joined Mr James Rose-Innes, the ship’s Chief Surgeon, in an effort to calm the passengers and make sure they exited the saloon in an orderly fashion. Now on the bridge, Captain Manning ordered the ship about and, as damage reports began filtering in, he made the decision to head back to Simons Bay, some seven hours away. As a precaution he ordered the 2nd officer Mr Charles Forder to provision the lifeboats and to assemble the passengers on the poop deck under the direction of the Chief Surgeon. The ship’s carpenter, Samuel Roberts, reported that two of the holds were shipping water. Whatever they had hit had damaged the port side of the vessel. The Teuton was sturdily built and had recently undergone major refurbishment. Captain Manning was therefore confident that by controlling the water levels in the holds, the seven bulkheads would stand firm and they could reach Simons Bay. As a further precaution he gave orders that the cargo be jettisoned in order to lighten the ship. Male passengers took turns at the pumps but even though these were continuously manned, the water gained steadily and the Teuton slowly began to settle at the bows. On the poop deck, the passengers talked quietly among themselves. Of the 157 passengers on board 95 were women and children and it could not have been an easy task to maintain order under such alarming circumstances, yet calm did prevail. By 9:30pm the situation was dire. The water had already reached the passengers’ cabins and luggage was floating in the companion ways. The bows were now so far down that the propeller was clear of the water. The Captain ordered the engines stopped and the steam blown off. At about 10.15 pm the lifeboats were lowered and the women and children began to embark. This was no easy feat as there was a ground swell which made it difficult for the inexperienced passengers to get into the boats. Apart from that, conditions were fine. The sky was clear with bright moonlight bringing everything into silvered relief. Only a slight white haze hung over the distant horizon. One of the lifeboats carrying women and children was already afloat but its ropes had become entangled in a pilot ladder. The crew was trying to free it when without warning the Teuton flipped almost vertically. With a sudden rush of air and spiraling debris her bows plunged beneath the water and literally within a minute she disappeared into the swell and was gone. Of the approximately 242 souls on board only 27 lived to tell a horrified world what had occurred on that beautiful moonlit night. Three lifeboats survived the sinking but they bobbed uselessly upside down in the water with poor wretches clinging as best they could to the keels. Roberts the ship’s carpenter managed to put one to rights and a number of exhausted survivors clambered in. They then got to work rowing towards the sounds of cries for help in the water. The sea was thick with debris making it difficult to navigate but in the bright moonlight they managed to pluck some 20 other half drowned souls from the water. They rowed around until the sun came up looking in vain for more survivors but at last, they had to give up. After setting the other two lifeboats to rights they redistributed the passengers between them and set sail for Simons Bay. Two boats reached the village of Simonstown the next day and the other, after missing the entrance to the bay, put into Table Bay the day after. The survivors were given every comfort and sympathetic support by the good citizens of Cape Town. Within days a Court of Inquiry into the disaster was convened at Simonstown with J Campbell Esq. R M and Captains Penfold and May presiding. It lasted several days and most of the survivors testified. Their stories bear testimony to the courage and discipline of the passengers and crew. Mr Bernhard Kromm, a South African hotelier who had embarked at Cape Town on his way to Algoa Bay recalled that he was on the poop deck when the Teuton began her death plunge. He could not swim but some instinct made him jump as the ship slid “at lightning speed” under the surface. Twice he was sucked under by the vortex of the sinking ship but managed to grab hold of a wooden bollard cover which took him to the surface. Shortly thereafter he heard voices and saw one of the lifeboats heading his way. Mr Joseph Allen was sitting on deck playing the concertina when the ship struck. His wife was below putting their three little children to bed. He had previously had ten years at sea as a ‘sailor boy’ and knew that there was big trouble ahead after the collision. He immediately offered his help and was put to work jettisoning cargo. At 10:15pm the boats were lowered and he saw to it that his wife and children were ready to board. “About 15 minutes later,” he testified, “I heard a rumbling noise forward. There was a wild rush of air and I saw the water come over her bows. I saw her nose go under. I jumped into the sea, was taken down, came up to the surface about 100 yards astern of the ship. I saw a boat and was taken on board. I did not see the boat with my wife and children but we picked up about 19 or 20 other passengers.” He was never to see his family again. Out of 95 women and children only one survived. She was 16 year old Lizzie Ross who together with her parents and tiny sister had left Glasgow for Cape Town in search of a better life. In a cruel twist of fate however, her father, on reaching Table Bay, had not taken to the town and decided to continue on the next leg of the journey as far as Knysna. They were all lost and Lizzie was left alone on a strange continent with all she held most dear at the bottom of the ocean. Mr Charles Forder the 2nd officer testified that they had passed Cape Point at about 2pm and that compass verification had been done at Bellows Rock. The ship was doing 12 knots most of the way. The captain had personally checked the ship’s heading before going down to dinner and thereafter 3rd officer William Diver had the bridge. The Court found that the loss of the Teuton was directly attributable to the “injudicious navigation adopted by the Captain.” They also found that the Captain’s initial decision to make for Simons Bay was a fair one but given the rapidly altering circumstances, it should have been evident that this could not be achieved. It was therefore a “grave error of judgement” that the Captain had not taken steps sooner to ensure the safety of the passengers and crew. 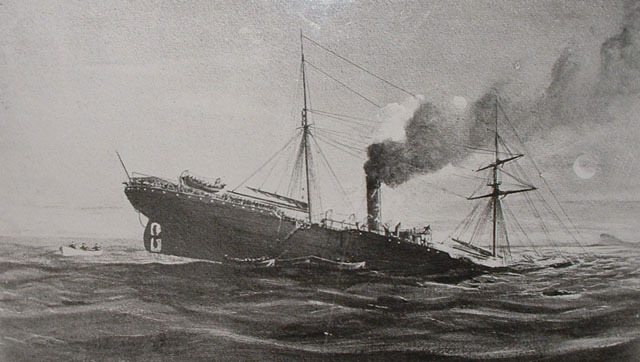 The court acquitted 3rd Officer William Diver who was in temporary charge of the ship when she struck. To all intents and purposes, the tragedy had been explained, blame had been apportioned and the case closed. But for every person on that ship, someone had been left behind. Wives, mothers and children had been left without breadwinners. Some entire families had simply ceased to exist. The aftermath of the loss of the vessel was far reaching. Hundreds of families lost loved ones and many were left without breadwinners. In Victorian England it was nothing short of a calamity for a wife with young children to suddenly find herself without the means to support her family. The list of some families of crew members recorded in the Times of London bears testimony to the tremendous tragedy of this event. Mr Purkis, the Chief Steward left behind a wife and 5 children, the eldest being 10 years old and the youngest just 5 months. His promotion to Chief Steward had been the cause of so much celebration in their home not a month previously. Mr George Corbin (51) the first waiter left a wife, Elizabeth (43) and 5 children. The Pantryman, Mr George Still (32), left a wife Annie (35) who was due for confinement and 4 young children. Mrs. Hayes, a stewardess, left an invalid husband and five children behind. The youngest was only 2 years old. The stories go on and on. A fund was set up by the Mayor of Southampton for the relief of the widows and orphans to which many South Africans also contributed. Amongst the thousands of donors was Captain Manning’s elderly father, Mr Charles J Manning, who contributed the substantial sum of 100 guineas “on behalf of his surviving family and his dear son”. But at best, the relief could only have been of a temporary nature. One can only imagine what trials lay ahead for these families. And then there was the enigma of 42 year old Captain Edward Manning himself. Here was a man who was spoken of in the most respectful terms. According to all accounts he was a capable navigator. He was “of careful turn of mind and unassuming and kindly in his manners.” He had been with the Union Company for 15 years of which 6 were as Master of the Teuton. He had sailed the route from England to the Cape on countless occasions and no doubt knew every weather condition, every bay and every rock along the route. His Chief Officer Eugene Wardroper similarly had years of experience as did the other officers. What then had gone wrong? 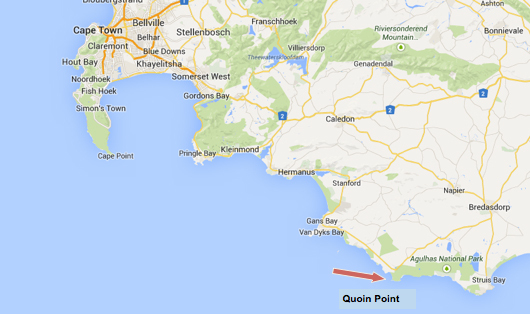 We know now that the vessel had struck the outermost rocks off Quoin Point. We know that these rocks were charted and that Manning knew of the submerged dangers in the area. He had sailed past them numerous times every year. We know that he had checked the heading of the ship before going down to dinner and had made a slight alteration to that heading. What we don’t know is why he did not pick up that the heading was incorrect. Was it incorrect? Could the instruments have been faulty? Were the earlier compass verifications inaccurate and if so why had no-one noticed? Little is known about what happened to the survivors after the wreck of the Teuton. Most of the surviving crew was taken back to England a short while after the disaster. Mr Bernhard Kromm continued his hotel business and died in Kimberley in 1895 aged 61. Mr William Oswald Diver, the 3rd Officer on the Teuton, went on to have a distinguished career in the mercantile navy and received a medal and ‘a binocular glass’ from the Board of Trade in 1898 “for gallantry in saving life at sea.” At the time he was 3rd Mate on the SS Lisbon which assisted in the rescue of the crew of the Steamship Newminster from the icy waters of the Bay of Biscay after gale force winds had wrecked their vessel. His brave efforts were no doubt spurred on by the memory of his own helplessness as he had floundered in the sea off the South African coast nearly 20 years before. The story of the RMS Teuton is little known today. The research and writing of this article serves as a modest memorial to those who perished and also to those families whose struggle for survival only began after this tragic event. What a fascinating story. I have a letter (hand written copy) by my great grandfather, Eugene Dominic Nicolle, (Emigrated to Australia in 1852, and later became a naturalised British citizen).EDN was a passenger on the SS Potosi, left port (the Cape) the day after this tragedy. He writes of this in the letter he sent back to his kin in France. EDN remarks they left the same day & hour from Plymouth, but arrived 18 hours earlier in the Cape. Thanks for sharing this Bill – it shows how the news of the tragedy spread so quickly. I think there must be many letters of this kind out there and wouldn’t it be great if one could publish a collection of them one day? What an amazing story that I knew nothing about. My Irish ancestors came to South Africa on board SS. Teuton in April/May 1881. WOW!! !